Reflections by Robert Malcom McLaren. Seen from the plane, the only Namibian landscape I know – low round bushes, growing sparsely on level plains, broken only by occasional and apparently quite arbitrary knolls, brown and dusty-looking – was unexpectedly green. There had been rains a couple of weeks before and this seems to have transformed everything. But still it was the same old landscape, only rather green as opposed to rather brown. I had been to Namibia only once before, to facilitate the Southern African Theatre Initiative (SATI’s) ‘Finding Feet’ workshop in Windhoek. This was the only Namibia I knew. It took a Meneer van der Walt to make me see Namibia differently. 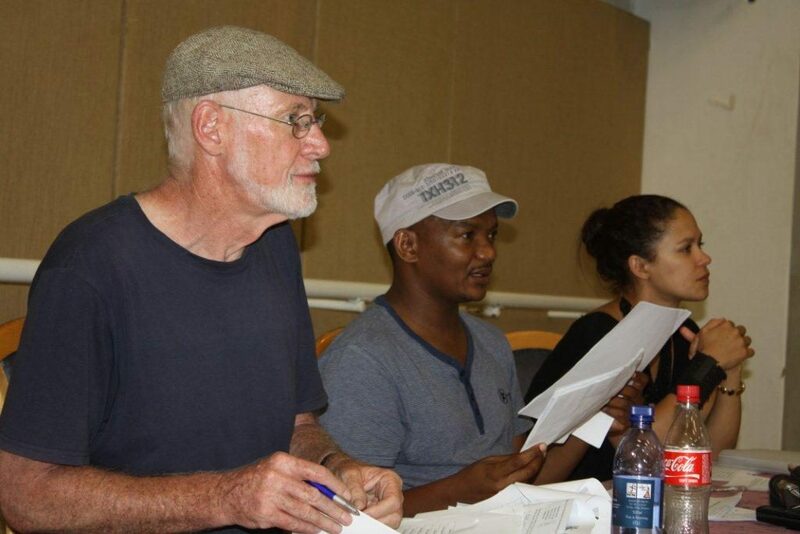 This time I was in Namibia to conduct auditions and run a workshop for those selected to participate inthe regional ‘Negotiating Ibsen in southern Africa’ project, for which CHIPAWO World had received an Ibsen Award. In brief, this project involves a regional co-operation between South Africa, Zimbabwe and Namibia with its first phase culminating in a playmaking camp in Harare in March. After touching down, I was picked up by Timo, the National Theatre of Namibia driver, in a very nice new 14-seater. Just outside the airport he stopped for a man who was standing on the side of the road trying to get a lift. Once he had got his lift, he soon produced a woman from somewhere and they both got in. Immediately the smell of hard drinking filled the minibus and along with it the jollity, now painfully suppressed, that sometimes accompanies it. The woman did not want to stop singing but the man did not feel it was appropriate and from time to time her song would start up, followed by a sharp reprimand, then an indignant objection and silence before inexorably starting all over again. It went on like this till they were dropped at a turn-off to a small village. I said to Timo that I just hoped the man would not beat her now. When we got to Windhoek, I was taken to the Gasthof Rosa-something or other. The next day I was going to rue the fact that I had not taken better notice of its name and locality. My room at the Gasthof was, though small, clean but for some reason a lot of things in it didn’t work. The first of them was my bedside lamp – the bulb was kaput. The next was that there was no remote for the television and finally the basin in the bathroom had no plug. However it is the blown bulb that is important to my story. I took the bulb out and went outside, brandishing it but obviously looking lost until a voice emerged from the shadows, to be followed in a moment by its owner – who was a Meneer van der Walt. He asked me in English what the problem was and when I told him, went off into the house to look for a replacement. It worked and I thanked him in Afrikaans. He became immediately animated by that and asked me if I could speak Afrikaans. I said that as a South African I could make a try. He needed no second invitation and began what became quite a long conversation on his side in very lively Afrikaans and on mine, well, I did my best. The first thing I noticed was his accent, quite different from any other Afrikaans I had heard. I was told later that some people think the Afrikaners in Namibia, who must to some extent have been influenced by German, speak Afrikaans rather like cats! It’s sort of singsong and high-pitched. However it was the said van der Walt, who being apparently ubiquitous in the Gasthof, who met me the next morning and gave me a lesson about Namibia. On the way to the breakfast room, which I had been looking for, he explained to me that he was a painter. Once there he put on a set of spotlights, which lit up a series of paintings on the walls and these entirely encircled the guests as if the breakfast room were an art gallery. Every one of them was a landscape and every one of them set in Namibia. He had not painted a single human being – but rocks, sand, rivers, canyons, mountains, reeds and bushes there were aplenty. He was skilled enough and had captured faithfully not what he had experienced – as it turned out – but what he saw in photographs. And that was where I saw the immense topographical variety of this country I had thought was all dust, bushes and desert. There were the lush rivers and forests of the extreme north, near the Okavango. There was a majestic canyon with a river with actual water in it, way down at the bottom winding its way instinctively to the sea. There was one which showed a tarred road and white drifts or dunes on either side of it, which seemed well on their way to swallowing it. “Is it sand or snow?” I asked him. ‘Sand’, he said. There were the usual knolls and round bushes but some of the trees looked as if they had been painted by Magritte or Salvador Dali. I am sure that van der Walt had not stylised them. That is obviously what they really look like – reality outdoing the surreal. So that was my first education about Namibia – its topographical magnificence and variety. I was about to experience the next – its demographic magnificence and variety. After breakfast I made my way on foot to the National Theatre, which Timo had shown me the previous night. I could never forget the address as it was on the same road, John Meinert, that had taken us out to the Gasthoff – and on the corner with Robert Mugabe! But how to get to John Meinert! I just could not find it. I asked a truck load of Namibians and they didn’t have a clue. ‘We are from the North’ they said, as if that explained everything. A woman working on the grass verges also didn’t know. Anyway eventually I stumbled onto it and from there it was a straightforward walk down John Meinert into town. When I got to the theatre, I first met members of the National Theatre team – Alma Ulamba, Manager, Projects, Production and Programming, and Keamogetsi Molapong, who is in charge of community outreach and youth theatre. Werner Thaniseb, the Director, who had accompanied me to Skien in Norway to receive the award, was away on family business,. He would be with us the next day. Then along came Natasha, also a theatre personality, but now in the Ministry. 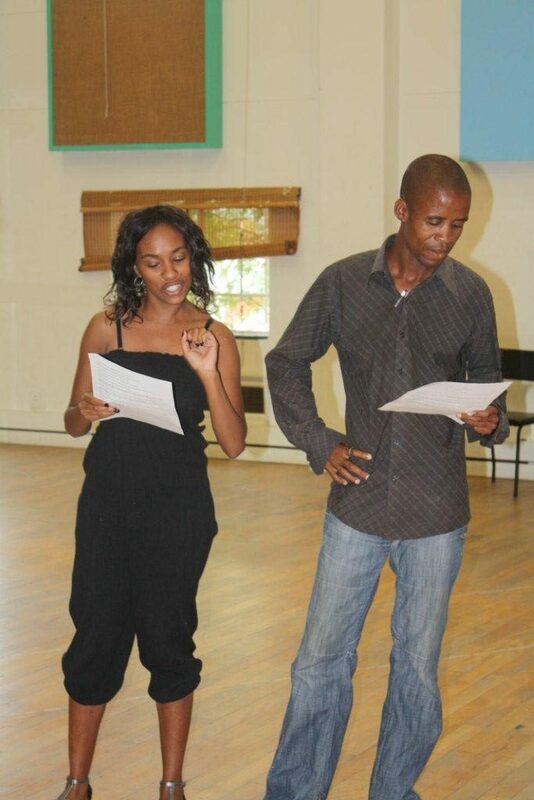 She, Mola (as Keamogotsi was popularly called) and I were to be the auditioning panel. The National Theatre of Namibia is a magnificent facility, the like of which does not exist in many other African countries, including Zimbabwe. On stage, with the curtains down, I felt I was in a vast gymnasium or rehearsal room. In the actual rehearsal room, where the auditions were to be held, was placed a table, complete with tablecloth and nice comfortable chairs. In front of the table, a little far away, was a semicircle of less comfortable chairs. Then scattered around in front of the table were four or five black boxes. I asked Mola if we could deconstruct the space. After moving everything left – to open up a nice free area to the right – we brought the chairs much closer together and sat on the boxes. Then they started coming in. I had my programme worked out. I would start with a Welcome and then Introductions. For the intros I asked everyone to say out their names – from where they were seated – and where they came from. I learned from this that while many came from Windhoek, others came from places all over the country, many of which I had never heard of. I remember Tsumeb, a mining town in the North. There was Okahandja, some kilometres north of Windhoek, and Arandis on the way to Swakopmund on the Atlantic coast. In particular I was fascinated by Karibib, a little town on the road from Windhoek to the sea. Originally a Herero waterhole, the town began to grow with the coming of the railway line from the coast to the capital. In the year 1900 the population of Karibib was 10! A few years later there were a little over 300 whites living there. Maria Josefina Ebenhaeser, a Damara, hails from Karibib. Apparently it is the centre of Namibia’s marble mining industry. And she gave a fascinating account of all the things she is involved in there. They have a theatre group and a youth association, of which she is the secretary. I later learnt that one of the National Theatre projects, run by Mola, involves a local theatre production, which will soon open in Karibib. The National Theatre assists with expertise and also equipment such as lighting. I told Maria that I would love to be invited to visit Karibib. It reminded me of the night I once spent at Kakamas in the Northern Cape, a small town on the banks of the Orange River on the road to Springbok, and the tiny little place we came to after that called Pofadder, which was like one of those dry and creaking in the wind little towns out in the desert that you see in Westerns. Not only did the young actors come from different parts of Namibia but demographically they were extraordinarily diverse, ranging from Khoi, through Nama and Damara, to Herero and Ovambo. There were some whom apartheid and racist terminology had decided should be referred to as ‘Coloured’ or ‘mixed race’. Namibians of all colours, languages, backgrounds and histories – and everyone seemed to just accept that that is what Namibia is, all Namibians, all with an equal right to be Namibians and accepted as such. It was exciting and made me, coming from far less demographically varied but far more polarised societies, feel a profound sense of respect and admiration – if not envy. We then got into two circles and did some children’s games which help people to learn each other’s names. I taught them the Zimbabwean game, ‘Dudu mduri’, and asked them to come up with a Namibian one. One circle did, the other couldn’t. Then those who had come for acting auditions were paired off and asked to choose one of three excerpts from Ibsen’s Ghosts, which is the play Namibia will be ‘interrogating’. They were to do it as a reading, in English. Then they were to prepare an impro based on an idea or issue in any of the extracts and relate it to Namibia. They could do this in any language. While they worked on their pieces, we went off to the stage of the theatre to audition for Dramaturg, Director and Rapporteur. There we spoke to the candidates, listened to their ideas and then endorsed Mola for Dramaturg, which is what the theatre had already recommended to me. The Dramaturg is expected not only to play a role in writing up material in the process of script-development but also to have a deep knowledge of Namibian society, culture, religion, law, politics etc. We then chose a director. As we were forming a youth professional company, the Director would be a trainee, becoming the substantive director after the script-development camp in Harare. Finally, we asked three of those wishing to be rapporteurs to write a report of the auditions so we could see an example of their ability to document as the Rapporteur will be documenting the work in the camp from a theatre processperspective. Then we went back to the actors. Now I saw for the first time the riches and depths of these young people shining out as they acted out their pieces. The young women were far more impressive than the men. There was one, a Herero, who, we learnt the next day, had been forced to leave her home as her family would not accept acting as a career. She was dark, with a deep voice, and, though young, seemed to draw her energy and creativity from a deep and distinctive cultural well. Many of the impros already had that electricity which improvisations generate and which has to be recaptured much later in the rehearsal process. After the impros we sat and discussed issues in the context of the Namibian reality. Some spoke freely, like the Director-elect, a tall drama student from the university with a unique hairstyle and a beaded forelock. He told us how conservative Namibian society is and how his hairstyle is not appreciated by many. One or two of those we were thinking of selecting were quiet. In our selection, I was aiming largely for younger actors – there were others who were older, obviously quite experienced and very good. I explained to them that the South Africans and Zimbabweans would be between twenty and twenty five so this might make it a little awkward for people in their thirties. I however assured them that they were very good and said I wished I had the opportunity to work with them. Now with some of the younger ones keeping quiet, I asked them directly what they thought. One of them was a young woman who had come up through the National Theatre’s schools program. She had not spoken at all but once asked, she did not hesitate and expressed her interesting and confident ideas with a startling sophistication and assurance. I couldn’t wait for them to be in Harare at the theatre camp working with the other young people from South Africa and the ones I knew well from Zimbabwe. When we had made our choice, I asked Mola what he thought we should do – announce it openly with all present or tell them we would email them. He felt we should let them go and email them. But I felt that as the whole process had been open, together and upfront right from the beginning, we should make the announcement to them while they were all there before they went home. He said let’s try it and we did. There were no problems. By that time it was late afternoon and everyone seemed to go away happy about the process we had all experienced together since morning. Those selected were ecstatic and no-one seemed to grudge their happiness and good fortune. The auditions were over but not the day. For one, when I walked home along John Meinert, I couldn’t find the Gasthof and walked around all over the place looking for it. I didn’t even know its proper name and kept telling people that I was looking for Gasthof Roussol and no-one else seemed to know any better than me. But walking around in the hot sun looking for the Gasthof was a trifle. Far more important was a place called Xwama. Alma had told me earlier in the day that I was going to be taken out to dinner. She recounted her experience the last time this happened. They had taken their guest to a conventional Western-type restaurant and at the end, the guest had rather plaintively said: “I thought you were going to take me somewhere Namibian.” So Alma asked me where I would prefer to go. Immediately my thoughts went back to a wonderful last night in Addis Ababa with Nebeyou, the young chairman of the Theatre Arts department, and the veteran legend of the film and theatre, Ato Haimenot Alemu. They had taken me to what in Addis they call an ‘eskistabet’ – literally a house of eskista, the characteristic shoulder-jerking dance of Ethiopia. We ate Ethiopian food, drank tej (honey beer) and at first watched but soon joined in the chefere – traditional dancing. So I said to Alma that I would like something cultural – and that is how we came to Xwama. Xwama is located in what was once the old segregated township of Katatura. True to form, the old apartheid regime had developed Katatura to be the black labour reservoir for the white city of Windhoek. What is more, it was not enough that Katatura should be reserved for blacks but those blacks had to be divided up into their ‘ethnic groups’. Though the years since independence have seen some dilution, the suburb of Katatura in which Xwama is located , is still overwhelmingly Ovambo – and that is where I was made my acquaintance with omalovu – the distinctive Ovambo version of the Zimbabwean chibuku or South Africa’s umqhombothi – lovely creamy beer made from millet (or sorghum), served in a claypot and ladled with a traditional gourd into carved wooden cups. The restaurant called Xwama, which neither Alma, Mola nor Timo, seemed to be able to translate, is a traditional house with walls made of poles and clay and a roof of thatch, built on the small plot of a typical township house. The interior walls are decorated with various traditional artefacts. Timo started off his meal with amacimbi or mopane worms. Not for me! I’m really quite conservative in what I eat – I do not eat worms neither do I eat any insides, including liver, kidneys, tripe, heart and tongue. So I enjoyed a meal of what the Namibians also call ‘pap’ (stiff porridge), ikaka, which is spinach, a bean dish, the name of which I have forgotten, and chicken, washed down with omalovu. The pap, like the omalovu, was made out of millet and in texture it was what some people used to refer to as Pedi pap – rather moist and sticky. Mola had a sheep’s head or what in South Africa we used to call half skaap. It was a lovely evening – but why the US American music, why? Where has this fixation come from? Our music is much better than theirs – so why? Everywhere? The next day was a workshop during which we dealt with the nitty-gritties of contracts, transport and the camp program as well as getting the ball rolling as far as ‘negotiating’ or ‘interrogating’ Ibsen’s play was concerned. I had chosen five extracts from the play. We read them, I summarized some of the issues and then Mola chaired discussion on what these issues suggested in the Namibian context. No shortage of ideas nor readiness to speak and discuss – and it all augured extremely well for the camp in Harare. We finished the workshop by early afternoon and I was again taken out – this time to a Nando’s, where I had a ‘Portuguese salad’ with more feta cheese than lettuce! Washed down with two Windhoek lagers. The shadows were beginning to lengthen as Timo drove me out to the airport – which is 40 kilometres from Windhoek. No party-poopers this time. I was in good time for the flight and had good conversations before and during it, arriving back in Johannesburg with a lovely relaxed feeling of having been somewhere really nice, a slight ache to be there still and a glowing admiration for the wonderful, creative, varied and cultured young people I had left behind. Roll on the Ibsen Theatre Camp in Harare when we can be together again!